Air conditioners employ the same operating principles and basic components as your home refrigerator. Refrigerators use energy (usually electricity) to transfer heat from the cool interior of the refrigerator to the relatively warm surroundings of your home; likewise, an air conditioner uses energy to transfer heat from the interior of your home to the relatively warm outside environment. An air conditioner cools your home with a cold indoor coil called the evaporator. The condenser, a hot outdoor coil, releases the collected heat outside. The evaporator and condenser coils are serpentine tubing surrounded by aluminum fins. This tubing is usually made of copper. A pump, called the compressor, moves a heat transfer fluid (or refrigerant) between the evaporator and the condenser. The pump forces the refrigerant through the circuit of tubing and fins in the coils. The liquid refrigerant evaporates in the indoor evaporator coil, pulling heat out of indoor air and cooling your home. The hot refrigerant gas is pumped outdoors into the condenser where it reverts back to a liquid, giving up its heat to the outside air flowing over the condenser’s metal tubing and fins. 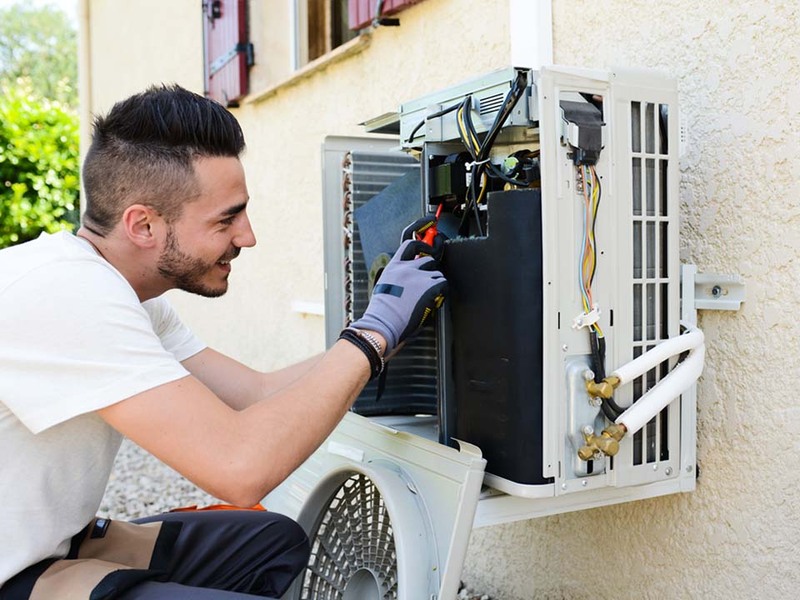 When your air conditioner needs more than regular maintenance, hire a professional service technician. Our well-trained technicians will find and fix problems in your air conditioning system.